Addiction transference: It’s not the food. It’s the issues behind the food. Being thin isn’t going to magically make you happy and solve all your problems. Discarding the fat suit doesn’t magically transform you into a completely new person. You can’t run away from yourself by changing your appearance. All the crap inside you that made you fat in the first place? It’ll still be there when you’re thin if you don’t deal with it. I scoured the TV station’s website to find a link to the story to share, to no avail. I did find an extremely interesting article on the lap-band website: Addiction Transference and Lap-Band Surgery: It’s easy to trade another addiction for your food addiction. I had two observations after reading the article. I was glad that the company acknowledged that addiction transference is a possible issue for their patients. Hopefully they make the patient aware of it ahead of time and take proactive steps to prepare for it. I was annoyed that the article emphasized the physiological reasons for addiction rather than the emotional ones. Here are a couple of examples. Consider the source: I’m reading an article provided by the providers of lap-band surgery. Of course they’re going to want to blame addiction on something physical in your brain. God forbid they should hold a person accountable for their emotional issues and choices. That’s not what they’re selling. To be fair, I must add that the article concludes by saying that if someone is at risk, the patient should seek extensive counseling and possible medication to treat addiction transference. While writing this post, I was playing Words with Friends on Facebook with my husband. This ad popped up. 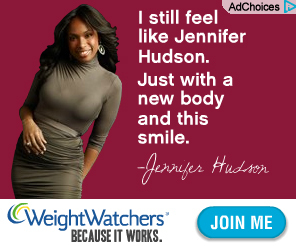 It makes Jennifer Hudson sound so healthy emotionally, like she is comfortable in her body, no matter what size she is. I hope it is true for her! 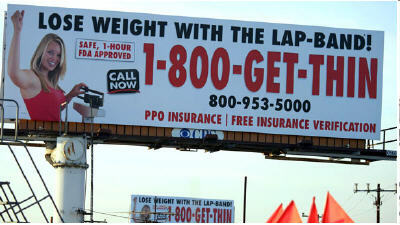 When I started my weight loss journey, I considered lap-band surgery for about two seconds. I know it’s helped a lot of people, but there’s just something about it that bothers me. I know I need to fundamentally change myself inside and that can’t be achieved by having a superficial surgical procedure. I know I need to change my habits, deeply ingrained in me for over forty years and it feels like cheating to take the short cut. I know it won’t solve the real problems of why I got fat in the first place. There is no quick fix for that. No way.